To make the water system professional’s job just a little easier, Franklin Electric introduces a new troubleshooting tool for QD Control Boxes. 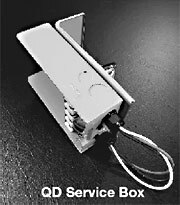 QD, of course, is short for “Quick Disconnect”, and the QD Control Box offers the benefit of quickly and easily removing the components in the box. For systems that use the QD Control Box, this new diagnostic tool, called the QD Service Box, allows easy measurement of motor voltage and current while the motor is operating. Measuring the amount of current between the Control Box and the motor is important and helpful because it indicates how “hard” the motor is working. As a general rule, the motor current should never exceed Service Factor Max Amps (SFMA). If SFMA is exceeded, this is an indication that the motor is overloaded. This could be caused by several factors, including operating the system at open discharge, or on the far right side of the pump curve. If the current to the motor is much lower than expected, this indicates the motor is underloaded. Although this doesn’t always cause a problem for the motor, it may indicate a problem somewhere in the water system, such as a plugged intake or screen. Values for Service Factor Max Amps for all Franklin submersible motors can be found in the Franklin AIM Manual.